Transgender Tuesdays is finally available for home viewing! IndieFlix offers a free first week, after which it is $5 a month for a curated collection of independent films, both documentaries and narratives. It can be watched on Roku or Xbox 360 if you have either connected to your TV. When you watch it on IndieFlix, please review it. We are new there, so our rating is only 70% until you say otherwise! Fandor provides a huge selection of docs and narrative films, including many classics (in glowing black and white!) and foreign films. The also have a free trial period, of two weeks, and if you stay it is $10/month (or less). Fandor plays on Roku, Chromecast and all handheld devices. How well we do on IndieFlix or Fandor could help determine if we get onto Netflix--which is hard to do for a documentary not made by Michael Moore or Spike Lee! So even if you have seen Transgender Tuesdays in a film festival, please check out either of these sites, rate our film, and help it get notice. And if you haven't seen the full version, you are missing out on some great stories. Then if friends or family haven't seen it, why not forward this page so they will have these links. And we have some sad news to add to the updates below. Angel Ichord passed away October 9, less than 2 years after her gender surgery in Thailand. At least hers was a quick and non-traumatic passing, caused by a simple infection that got out of control. 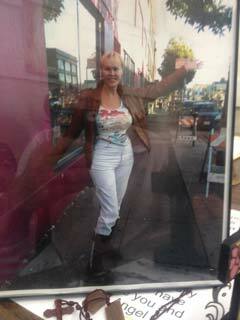 She is remembered by hundreds of people in the recovery community, and by her transgender sisters in San Francisco. She was a sort of beacon, someone who had made it through severe drug use, street prostitution and frequent jail terms, and was willing to talk about all of that to help others. Hers was a regular bright presence in the waiting room of the Transgender Tuesdays clinic, bringing in new patients and supporting all those she knew. Watch the film again to appreciate her honesty, courage and great heart in her journey from the Ozarks to San Francisco's Ocean Beach. We will all miss her. WHO is behind the scenes making this film? Director Mark Freeman was a Family Nurse Practitioner at Transgender Tuesdays clinic from its inception, until retiring last year to focus on his art. He also produced "Healing Tales" on KALW-FM, a storytelling series for people living with AIDS and those who care for them, and the video blog about pop music across generations, “Now Then & Back When.”. Nathaniel Walters-Koh, a producer on "Survivor US" TV show, and current graduate student on documentary film in London, is the co-Director and Editor. Veronica Klaus, acclaimed jazz song stylist, narrates the film. Director of Photography Kingsley Lara had help from camera-person Clive Walker. Animator Marta Martinez contributed to the logo, which was designed by Michael Starkman. Rounding out the production team are: Mitch Layno, founder of CLay Management film production in the Philippines and now in Los Angeles; Stephanie Roy, campaign director on behalf of ACLU and EQCA who became our Campaign Manager; Stephanie Madrinan, our "designing woman" who gave us a locale in her fabulous store 31 Rax at 3309 Mission Street in San Francisco; and Ken White, our Best Boy. Veronica Klaus performs bi-coastally. You can get her latest CD, “Lee a la V,” a gorgeous tribute to Miss Peggy Lee at her site www.veronicaklaus.net. 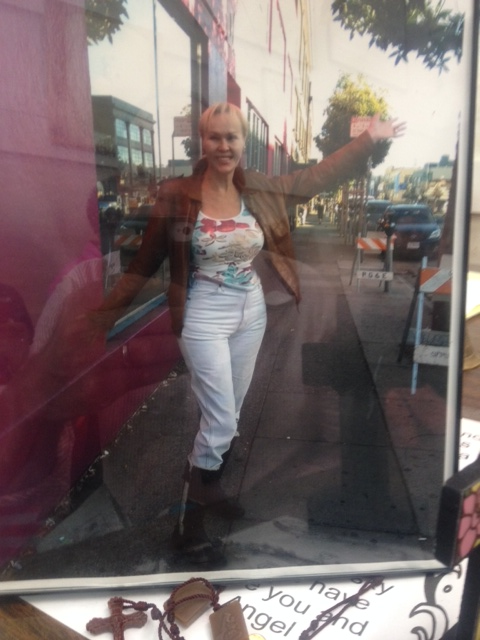 Marilyn Robinson is still seen on the streets of San Francisco, but only when dog-walking Bella and Maggie. Red Jordan Arobateau helped present our film at 2012 Transgender Summit. His books are available online. Candi Guerrero put herself into remission for liver cancer with alternative medicine and her spiritual practice. Angel Ichord has been clean and sober for 11 years and now sponsors others. She recently traveled to Thailand. Nyra Oeun lives with her family & is now getting dental care to repair trauma from her 2009 automobile accident. Nola VanDella kicked Hepatitis C last year. Her drawings continue to “reflect the way I hear and see music." Astrid Olsen and her partner now live calmly in a high-rise, not far from the docks of the Bay. Cecilia Chung is now a San Francisco Health Commissioner, and was recently appointed by Barack Obama to the Presidential Advisory Council on HIV/AIDS. Dustin H. used the film to re-connect with family after 20 years, and has moved back to Washington State. Kelly J. Kelly now studies Pre-Law at California Institute of Integral Studies. Claudia Quijano graduated from Paul Mitchell Cosmetology School and City College SF and now works at 3155 Salon in San Francisco. Not yet receiving email updates? Sign up to stay in touch! Now on Vimeo on Demand for home viewing!